Experienced Health Professionals... Achieving Results. Healthcare leaders need information to make informed decisions about where to invest their limited resources. This is often forward-looking, predictive information that works to determine what the future will hold and how to respond to it accordingly. Nevertheless, with all the changes in healthcare, predicting the specific future state facing your organization is even more difficult. 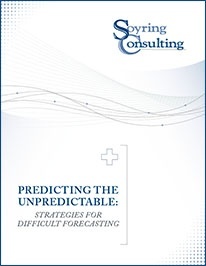 Predicting the unpredictable is less about concrete numbers and more about comfort level and risk factors. Soyring Consulting provides managerial and operational consulting services to healthcare facilities of all sizes, including For-profit, Not-for-profit, Community, University, and Faith-based facilities and systems. Our firm is a leader in Surgical Services, having assisted more than 400 hospitals' and healthcare facilities' Surgical Services departments.